The park extends to approximately 1100 acres. Its oldest visible archaeological feature is a wide low ridge crossing into the park from Sandy Lane. Its proximity to the remains of the Bronze Age barrow across the lane suggests a history of occupation of some 4,000 years. Other features, forming a rectangular pattern, suggest Roman occupation and are supported by pottery found locally. They underlie conforming patterns of medieval field cultivation. In the landscape covering over half the park there is evidence of Anglo-Saxon occupation with their Ridge and Furrow system of agriculture, then a new method of land use. The land at this time formed part of the Hounslow Hundred, and was owned by the (non-resident) Kings of Mercia. One of the last of these was Leofric (d1057) whose widow, the Lady Godiva (d1067), probably inherited and gave the land to the recently founded Westminster Abbey in about 1060. After the Norman invasion of 1066, Hampton was passed to Walter de St Valéry. His descendants transferred it to a London merchant, Henry de St Albans, who sold it in 1237 to the Knights Hospitaller of St John of Jerusalem. 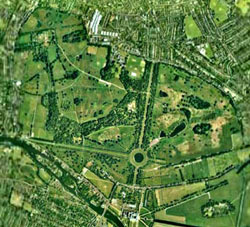 The Order already owned a house on the site of today's Hampton Court Palace, and the neighbouring Manor of Hampton was purchased to employ new land management techniques designed to maximise the profit necessary to fund their overseas exploits. Instead, land already impoverished by single crop farming for generations was further degraded by the introduction of sheep. This led to the uncontrollable spread of bracken that covers the eastern area of the park to this day. In fact, sheep were insufficiently profitable and so rabbits were introduced in their place. Just before the Christmas of 1497 the royal palace at Richmond was destroyed by fire, an event that led the creation of Bushy Park. By making use of the Hospitallers' house, the royal court was able to entertain guests in the major diversions of the day: hunting, shooting and coursing, by turning part of the attached land into a park stocked with deer. Three hundred acres were enclosed, incidentally preserving the largest medieval field system in Middlesex. In January 1515, the Knights Hospitallers leased the manor to Cardinal Wolsey who rebuilt the old house in palatial style. 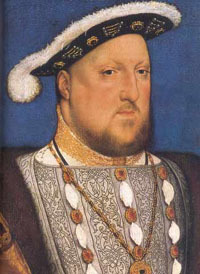 With his power seen as a threat to Henry, Wolsey gave Hampton Court to his monarch. In 1536, as Lord of the Manor and with the acquisition of Teddington, Henry set the boundary to the north side of the park as we know it today using the Sandy Lane Barrow as marker and sighting point to enclose the land. Brick walls stretching east from Hampton Court to Hampton Wick and west from Hampton Wick to Teddington were built during the following year, creating a favourite hunting ground for Henry and, later, Queen Elizabeth I. Thousands of acorns planted as future timber for Henry's New Navy were protected from the deer by thorny bushes, which by 1604 had given rise to the name of 'Bushie Park'. Sixteen years later, an area known as Hampton Eastfield was taken into the Tudor North Park to complete the park boundaries. During the Commonwealth period, Bushy Park narrowly escaped break-up thanks to Oliver Cromwell who was living at Hampton Court Palace by the courtesy of Parliament. In 1652 the park was bought by a property consortium led by Edward Backwell, a Goldsmith of London. Next year Cromwell, now proclaimed Lord Protector of England, sought to reclaim the Park so that it could be re-joined with the Palace. There was hard bargaining and he only achieved this in 1654, and at a premium. In 1638, Charles I had ordered a canal to be dug from the River Colne at Longford to Hampton Court Palace, crossing through Bushy Park. 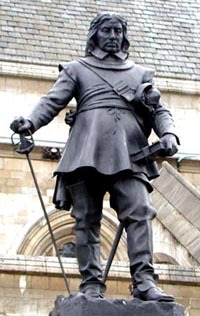 Cromwell was responsible for the digging of ponds to stock with fish and to cater for the new sport of angling. As well as feeding the new ponds, this waterway serviced the circular basin and fountain terminating today's 'Chestnut Avenue', and was later diverted by Lord Halifax into a high pond at Upper Lodge to feed his ornamental cascade. The Chestnut Avenue, formerly known as the Great Avenue, was laid out for William III to a design by Sir Christopher Wren in 1699. 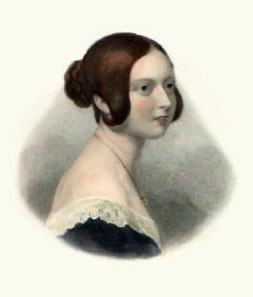 The work, supervised by William Talman, was undertaken first by George London and completed by Henry Wise. The fountain and statue of Diana by Le Sueur were placed in the basin in the centre of the round pond later. Upper Lodge and Bushy House, as they came to be called. Upper Lodge started as a 16th century timber building, a Keeper's lodge: it was rebuilt by the Earl of Halifax in 1709. Bushy House, formerly known as Lower Lodge had been built in 1663 by Edward Proger on behalf of Charles II, replacing another old Keeper's lodge, at considerable expense. 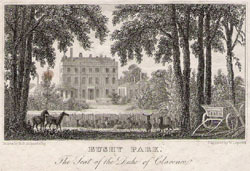 The next great change to Bushy Park came in 1797 when the Duke of Clarence enclosed all but 500 acres of the park. When he became king in 1830 and left Bushy, his intrusive fences were removed and, when Queen Victoria opened the gardens of Hampton Court, the park became a popular playground for the people. Visitor numbers increased and, as early as 1837 charabancs were bringing visitors to see the chestnuts blossom. This led to the annual celebration known as Chestnut Sunday. Locally, pressure increased for more entrances and, in 1883 the Hampton Hill Gate was opened, followed, in 1884, by the South Teddington Gate. By this time, sports had established a foothold. Led by cricket, from 1863, football, hockey, lacrosse, shooting, horse-riding and cycling followed.